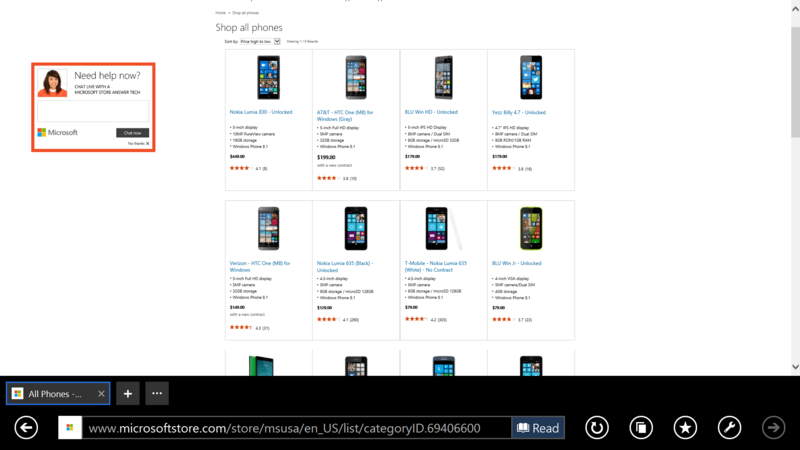 The Lumia 1520 appears to be gone from the Microsoft Store online. The last Windows Phone flagship device, which had been offered on AT&T, has been pulled from all pages on the site either under the AT&T section or the overall Windows Phone pages. I discovered this doing some research for a post that I will be posting tomorrow and was surprised. As of Friday afternoon the Lumia 1520 was still available directly from Microsoft on a contact from AT&T or without a contract for $549.99. Now it appears the only flagship device remaining is the Lumia 830 which is $49 on contract or $399 off contract from AT&T. While the Lumia 1520 has been pulled from the Microsoft store, it appears to be readily available from AT&T still on their online site. In the past if the Microsoft store was out of stock on a device you would still see it but with an “out of stock” note. With it completely pulled from the site, it looks like it may well and truly be gone for good. Likewise, it is still possible to get one at your local Microsoft retail location. I know here in the Denver area, my local store had the 1520 in stock. It is certainly disappointing to see this move as there is no expected flagship device from Microsoft until after Windows 10 is launched this summer. The need for a flagship device has been discussed heavily in the Windows Phone community and I made my opinion known on the subject a couple of weeks ago when I posted about Microsoft’s desperate need for a flagship device. Without one, Microsoft does not give consumers an option for a high-end, fully spec’d Windows Phone when compared to Android devices and iPhone.